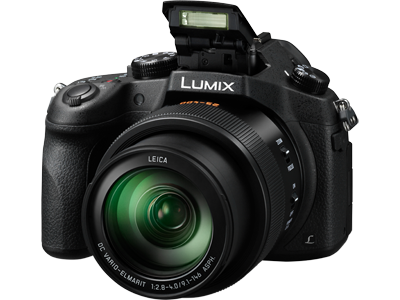 The DMC-FZ1000 offers a true Hybrid Photography experience for everyone. It combines 4K video recording capability (QFHD 4K: 3840 x 2160, 30 fps in MP4)* with the ability to switch easily between video and still capture for the ultimate in image creativity. The FZ1000 also enables in-camera playback screen grabs of (3840 x 2160) 8-megapixel equivalent hybrid photography photos from 4K video footage to capture the spur-of-the-moment shots often missed with ordinary still photos. 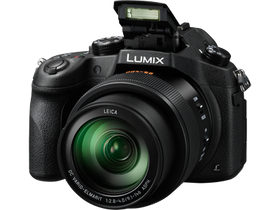 The FZ1000 is the Panasonic LUMIX flagship bridge camera with ultimate image quality. The superb images produced with a large 1-inch sensor and all-new lens fully express the limitless depth and sunlit warmth of nature. Its 16x optical zoom brings everything up close, from tiny birds on tree branches to animals crossing the distant horizon. Choose photos or videos in crisp 4K resolution. The DMC-FZ1000 is all you need to capture the world around you, in all its natural beauty. The newly incorporated 1-inch 20.1-megapixel High Sensitivity MOS Sensor improves the S/N ratio, making it possible to capture clear images with minimum noise even when shot at ISO12800 / Extended ISO25600. Rich amounts of light help produce impressive defocus with shallow depth of field. The result is truly stunning images in a wide variety of shooting conditions. The new LEICA DC VARIO-ELMARIT lens is created especially for the DMC-FZ1000. It has an F2.8-4.0 brightness that resists blurring even with telephoto shots, and an angle of view that extends from 25mm wide-angle to 16x optical zoom*. Comprising 15 elements in 11 groups, including 4 ED lenses and 5 aspherical lenses with 8 aspherical surfaces, this advanced lens unit achieves high MTF value. Adoption of 5 aspherical glass lenses achieves beautiful, evenly smooth defocus with invisible edge line, which is made possible by Panasonic's unique aspherical lens mold technology. A new linear motor integrated into the focus system achieves approx. 275% faster1 focusing, compared to the conventional DMC-FZ200. In addition new DFD (Depth From Defocus) technology2 shortens the time to set the focus. It instantaneously calculates the distance to the subject by evaluating 2 images with different sharpness levels. As a result, ultra high-speed AF of approx. 0.09 sec3 (wide-end) / approx. 0.171, 4sec (tele-end) is achieved. The HYBRID O.I.S. (Optical Image Stabilizer) + with 5-axis correction* gives you blur-less, one-handed video shooting ability. It detects and compensates for the camera's 5 types of movement - horizontal, vertical, axis of rotation, vertical rotation and horizontal rotation. The Level Shot Function* detects the image's horizontal line and maintains it even if the camera is tilted. It takes stable video even in high-angle, blind recording. For a more rewarding Hybrid Photography experience, add an optional External Flash (DMW-FL580L) with built-in LCD video light.